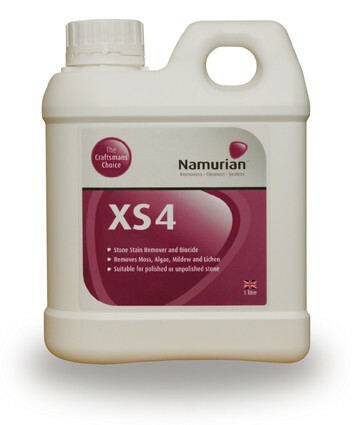 Namurian™ XS4 is the must have cleaner for exterior stone and masonry such as patios, paths and driveways. It also works brilliantly in the bathroom, shower or wet room. Biological growth is the most common problem you&apos;ll experience with stone and masonry that&apos;s outdoors or in damp conditions. The general dirt you&apos;ll see is often attached to microscopic organisms embedded in the pores of stone rather than the masonry itself. This cleaner removes moss, mould, algae, lichen, black spot, dirt and grime with ease - the dirt goes with it returning the stone to its original appearance. 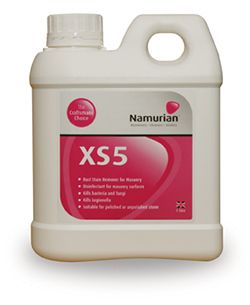 Namurian™ XS4 is designed for ease of use but please read product data and safety data sheets completely and carefully before using the product. Remember this product is chlorine based but is also safe to use given the required care and precautions are taken. It is the user&apos;s responsibility to ascertain the suitability of the product thus assuming liability thereof. We strongly advise that you test the product in a small and inconspicuous area to determine suitability. Apply the cleaner to the masonry in dry weather until it is well saturated using a brush, sponge, roller or low pressure spray. This typically consumes between 125-200ml per m² but will vary depending on the method of application, porosity of the masonry and the extent of organic growth and dirt. Leave the cleaner to dwell on the surface of the masonry for 10 minutes. If there is deeply ingrained growth and dirt then agitate the surface using a bronze, bristle or nylon brush and leave to dwell for a further 10 minutes. Longer dwell times of up to 2 hours may achieve better results and can be trialled in an inconspicuous area. Rinse the masonry well with cold, clean water. 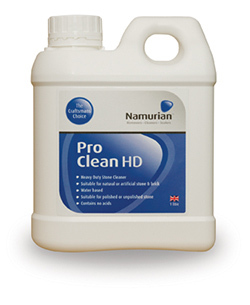 You'll typically require 10 litres of water per m² of masonry to thoroughly rinse and neutralise the cleaner. A garden hose or pressure washer is strongly recommended for cleaning large areas. This simple 3 step process often restores masonry to its original condition first time around. However, with more extreme growth and pitting you may need to repeat the process to achieve the desired results. It may also prove beneficial to experiment with alternative methods of application, dwell times and tools to scrub and rinse the surface. Avoid contact with skin. Wear eye protection, rubber gloves and waterproof footwear while using this product. This product contains chlorine and may discolour clothing, wear appropriate garments. Care required using this product in close proximity to vegetation. Caution required using this product in areas accessible to pets, wildlife or in proximity to ponds with aquatic life. 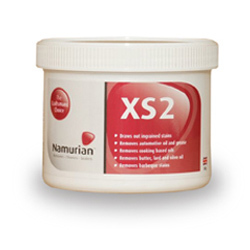 XS4 (2½ Litre) Buy bigger and save more money. 2½ litres will cover approximately 20-25m².